When Rotem, a sand cat who lives in captivity at the Ramat Gan Safari Park in Israel, lost her mate Sela last year, she was the only one of her species left at the park. Sand cats are extremely rare - there are only 116 left on the planet, and many are in captivity. Instead of having new kittens and helping keep her species alive, Rotem was all alone in her enclosure, mourning her lost mate. 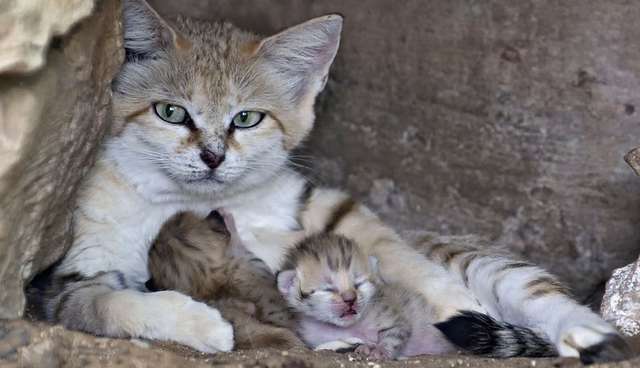 In hopes that she would have more litters, the staff brought in a new male sand cat named Kalahari, imported from captivity in Sweden last fall - which is pretty ironic, considering that the sand cat's natural habitat is in the hot deserts of North Africa and Central Asia. But Kalahari the Swedish sand cat and Rotem didn't quite hit it off. In fact, the two pretty much avoided each other, which is why caretakers at the park were so shocked to discover that Rotem had given birth to a surprise litter three weeks ago. Staff found her curled up with three new kittens - a total shock to the public but probably not a big surprise for Rotem. The Ramat Gan Safari Park has made international news before ... and not just for their cute babies: Back in January three of the park's rhinos made a break for freedom and ran right out through one of the park's exits, and in February an 18-month-old giraffe named Jengo died after complications from surgery. Rotem's new kittens are absolutely adorable, so here's hoping they stay happy and healthy for many years to come.